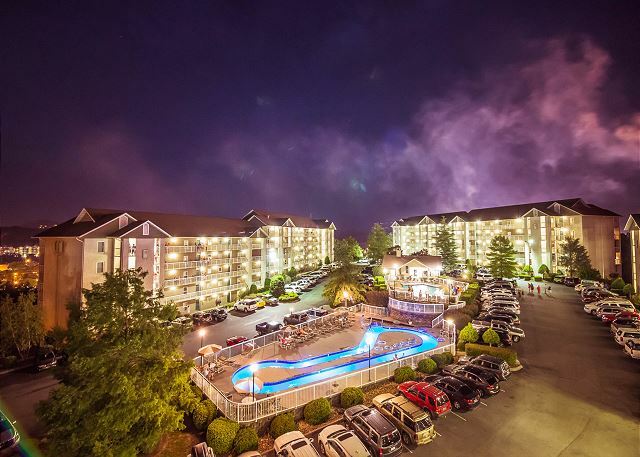 We vacation in our Whispering Pines Condo #WP422, in Pigeon Forge, too; so we feel like we know what you are looking for in a vacation rental! We have done our best to create a great atmosphere for you by providing all the features and comforts of home. We chose a warm and cozy mountain theme to go with the idea of vacationing in the Smoky Mountains! The bright and airy living room/dining room/kitchen area will lift your spirits and help you get into the vacation mood as the warm sunshine streams in! When we go on a vacation we want free Internet service, a fireplace, plenty of comfortable seating, a washer/dryer, and a complete kitchen that has no missing pots, plates or glasses, too! We think king beds are a requirement for comfort and we enjoy having TV's in the bedrooms, as well as our Whirlpool tub in the master; we hope you will, too! It was great! Condo was great, kids loved the indoor pool. Would love to come back in the summer with the kids if the rates aren't alot higher! So much more to do that we couldn't fit in to just two days and two nights! Perfect location! So happy to hear you enjoyed your stay! 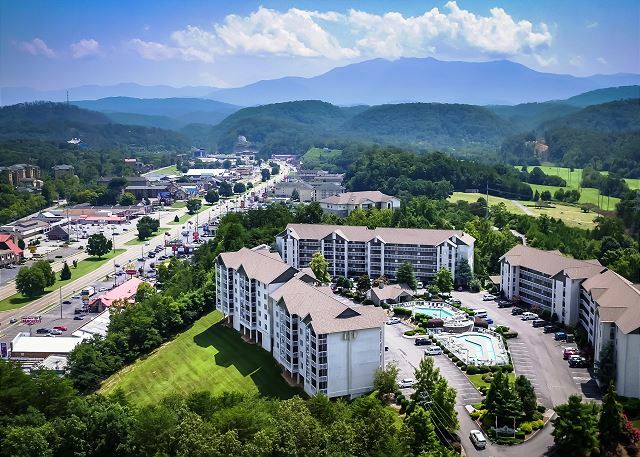 There is a lot to do here at Whispering Pines and here in Pigeon Forge - it does take some time to do and see everything. Hopefully, you all can come back and stay in the summer sometime. We would absolutely love to have you vacation with us again! Two things need to be done to make it perfect. The mattress in the master bedroom as well as the couch in the living room needs replaced. The kitchen is adequately stocked The location is very convenient and the cleaning staff is doing a fantastic job! Wonderful! Thank you so much so much for your kind words regarding our housekeeping staff. We will contact the condo owner in regards to your update suggestions for the mattress and the couch. We appreciate your feed back and look forward to your next visit. Thank you staying with us at Whispering Pines. We love hearing that you had a great stay with us. Thank you for your wonderful review. We welcome you back to stay with us again soon. 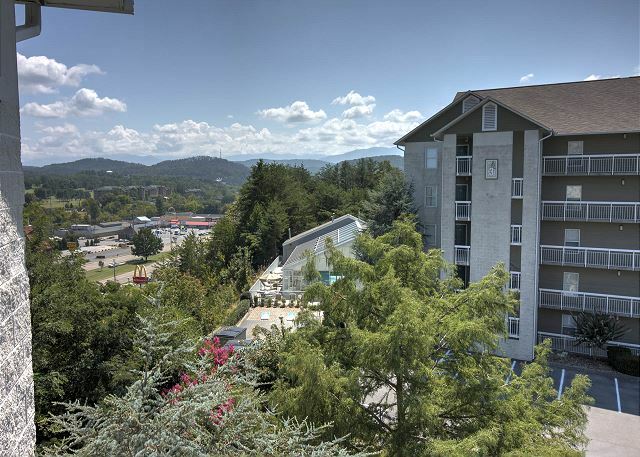 The condo is nice and comfortable, it’s about 200 yards up a big hill from the pigeon forge strip. The pools both indoor and outdoor were also very nice and the kids enjoyed them. Workers were helpful in instructing us were to go and when we had wasp on our balcony a maintenance man came in 10 minutes to get rid of them. Our view wasn’t the greatest, just some woods behind the building but we knew that when we rented it. No complaints whatsoever. 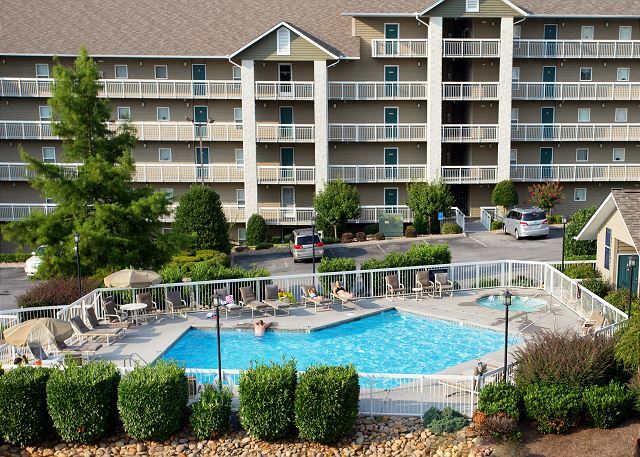 We are glad that you and your family enjoyed your stay at Whispering Pines in Pigeon Forge and that the kids enjoyed the pools. Glad that the wasps on the balcony were taken care of in a timely manner. We like to see your words, "No complaints whatsoever." Any time during your stay, let us know if anything needs to be brought to our attention. We desire that our guests have a wonderful vacation with us. Looking forward to your return. My husband, my parents and my 2 kids stayed here over the holiday. Check in was very easy and they were super friendly. They even called me before we arrived to make sure we would make it by closing time. The property itself is beautiful. You are right in the action without feeling like you are. From the balcony on the backside of the building you wouldn't have known thousands of people were lining the main drag. The condo was super clean, which is always my main concern. I normally won't let my kids take a bath in hotels but here I let them. My only complaints about the condo was the bed in the master matter which side you sat on you'd hear an awful sound. I felt like I couldn't move all night because I'd wake someone else up. I also felt like the walls were a little beat up, but that's no big deal. Overall it was a great stay! Awesome! So glad to hear you all had a great Thanksgiving and the Smokeys are the best place to give thanks! We love our homes away from home and always strive to make sure everyone enjoys there time with us! We will have a look at that bed and make sure the owner is aware of the issues! Please let us know anytime during your stay if you encounter problems and we will do our very best to make it right for you! Come back and see us again soon! Had a wonderful relaxing time. Had trouble with loose toilet in master bathroom was repaired with no more problems. Couch and both recliner chairs were a bit low hard to get back to your feet. Sofa bed couch was not comfortable to sit in. Back to low and not comfortable for resting against soft pllow like cushions gave no support. Rooms were very clean and well kept. Great! So glad you all enjoyed your time with us in our homes away from home! 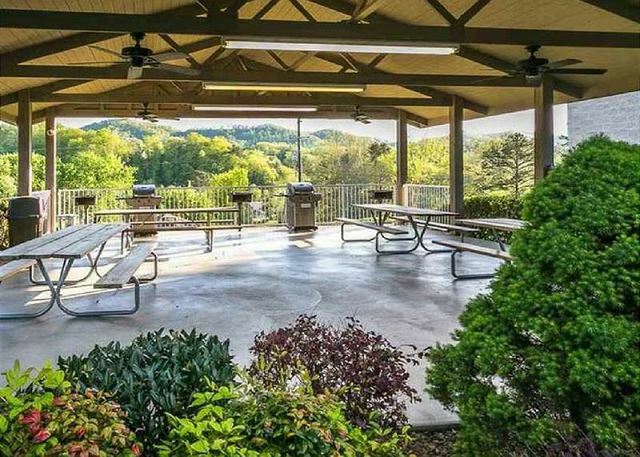 We are glad you all had a chance to come to the beautiful Smokey Mountains and relax! Come back and see us again next time you are in town! Awesome and amazing review; we ABSOLUTELY hope that you will visit us again. We appreciate your visit, perfect review and comments. See you next trip. The condo was great the only thing was we was relying on the sleeper sofa as a bed. But when we pulled it out the first night and laid on it felt like you was lying on springs. The mattress was so thin. So the person had to fit in the other bed. Thank you for staying with us at Whispering Pines Resort. We are glad that you enjoyed condo 422. We are sorry that the sleeper sofa was not comfortable for your party. We normally suggest the sleeper sofa for small children only. We apologize for the inconvenience. We appreciate your feedback and welcome you back to stay with us again soon. Thank you for staying with us at Whispering Pines Resort. We are happy that you had a pleasant summer getaway with us. We appreciate your feedback and look forward to seeing you again soon. Great experience!! Love staying at Whispering Pines!! Awesome sauce! Thank you for being with us and come back soon! Thank you for staying with us at Whispering Pines Resort. We are so happy to hear that you had a wonderful experience with us. We look forward to your return visits. Really enjoyed our stay here. Convenient, clean, comfortable. Son enjoyed the indoor pool. The staff was very nice and informative. Thank you for staying with us at Whispering Pines. We are so glad that you enjoyed your stay and our convenient location. We appreciate your kind words regarding our staff. Thank you for your wonderful feedback, we look forward to seeing you again! Property was clean and well maintained, I was told that there is 2 king beds and 1 queen when I was booking this condo but there was no queen bed in 2 bed room condo. over all it's good place to stay. Thank you for staying with us! Everything here is king size beds with many of the units having queen sized sleeper sofas. Sorry for the confusion! Hope you stay with us again soon! First time staying in a condo, really enjoyed it. The condo was nice, carpet had a few stains, & furniture had some scratches but overall was an enjoyable stay, loved that it was close to the Parkway. Awesome! Thank you for your review and we hope you will come see us again soon! This unit was very clean with all the comforts of home. 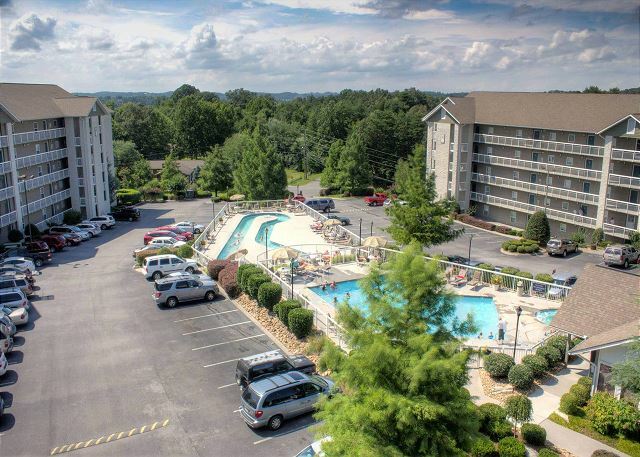 I always stay at Whispering Pines because they are always clean and the staff is very nice and I like the pools and it's very nice to have a washer and dryer in the unit. Very close to everything. Will always be a return customer!! 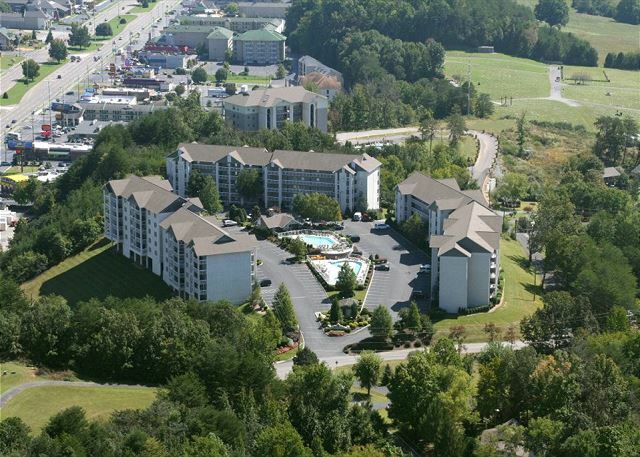 We appreciate your excellent review and patronage to Whispering Pines Condos in Pigeon Forge, TN. The comforts of home and being on vacation is a great combination. We look forward to your return visits. Loved the room and the location. Everyone in the office was very nice and very professional. We come to Pigeon Forge once a year and we will definitely be staying again!! We found our home away from home. Absolutely loved Whispering Pines. Thank you for your feedback regarding condo 422. We are very appreciative of your kind comments regarding our staff and our resort. We would love to have you as part of our extended family. We love having you as our guest. We look forward to seeing you next visit. Love this place. Very clean and nice. We love having you as our guest. Thank you for your review and look forward to seeing you during your next visit to Pigeon Forge. Our family had to travel to the Pigeon Forge area to participate in baseball. The property description was very accurate. We were very pleased with our stay. When we checked in the desk clerks were very friendly and we were given free tickets to some local shows. I would definitely use this condo again. Thank you for your kind comments about our Whispering Pines property. We are thrilled you enjoyed your time here, the free tickets and found the staff to be friendly. 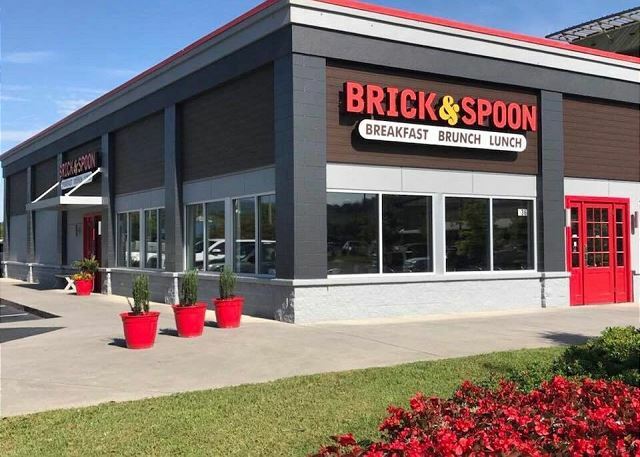 We hope you are able to return the next time you are in the Pigeon Forge area. We always love our stays at Whispering Pines and this time was no different. The rental was well equipped and furnished nicely. I would definitely recommend this unit to other guests. We are so happy to hear that you love staying with us at Whispering Pines. We appreciate your review and look forward to your next visit. The best time we ever spent in PF Tn. This is wonderful news! Thank you for staying with us at Whispering Pines in condo 422. We look forward to your next visit. Loved the condo, everything was very clean and the staff was great upon arrival. Had a problem with the hair dryer going out and it was replaced the same day. The only negative is the TVs were too small, the one in the living room was small and in a cabinet and could not be seen very well from the side. Football started and wished had a bigger TV to enjoy w/family. The one in the master was older and very small. But overall everything was great and would rent again! Thank you for your feedback! We are pleased to hear you enjoyed your stay at Whispering Pines in condo 422. We will be sure to pass a long the TV suggestions to the homeowner. We appreciate your patronage and look forward to your next visit. Quiet setting, staff was courteous. Felt safe! Thank you for visiting Whispering Pines while in the Pigeon Forge area. We are very pleased to hear that you enjoyed your stay and found it to be a quiet and a safe place to stay. Thank you for your kind remarks regarding our staff. We hope that you can stay with us again soon. Both condos were very nice. The grounds were very attractive. Spacious living ares. The sofa beds were poor and uncomfortable.Ladies at service desk sent air mattresses which were great. Pools were good except Lazy River; not enough current to keep you moving.Would recommend WOULD to everyone. Thank you for staying with us! Happy to hear you all enjoyed your condos. Again, we apologize about the sleeper sofas. We will pass the review on to that condo owner so they can look into replacing/repairing the beds. They are really just meant for children here at our complex, but I am so glad we were able to get some air mattresses up to you though. You deserve a good nights rest and we will always do all we can to ensure that you get one! We appreciate your business and look forward to your next trip with us! It's was very nice and pleasant. Like home away from home. 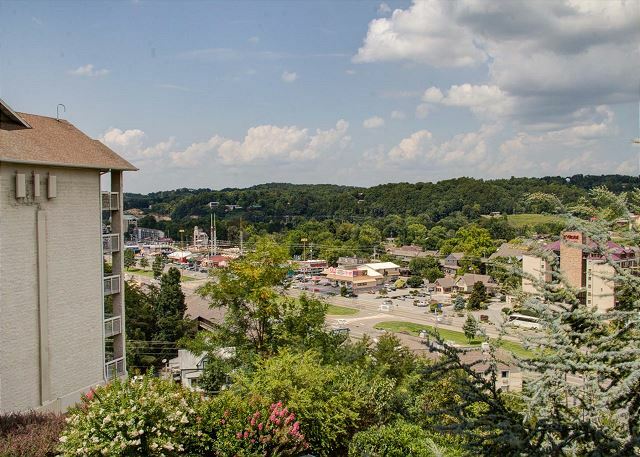 What more can be said for a wonderful unit 422 at Whispering Pines Condos in Pigeon Forge, TN. The condo was very nice. It was clean, well decorated, and spacious. It was perfect for our three night stay. We stay at Whispering Pines approximately once a year and we are always very satisfied. This year did not disappoint....another wonderful experience. We will definitely stay in this condo again! Keep making wonderful memories at Whisperingpines Condos in unit 422. Thank you for your positive comments and come to see us soon. Thank you so much for your feedback! We are happy to hear you enjoyed your stay with us in condo 422 at Whispering Pines! We appreciate your patronage and look forward to your future visit. We always stay at whispering pines wouldn't stay anywhere else. We love the staff who are like family to us now. Condo is always very clean and comfortable and well stocked. Already have a big family trip planed for December and we can't wait to come back. Thanks again for a wonderful time. See y'all soon. We had a great time, the condo was perfect for us and we enjoyed the indoor pool, workout room, sauna, and free movies! We are so happy to hear that you had a great time while staying with us. Thank you for your your wonderful comments regarding the your stay. 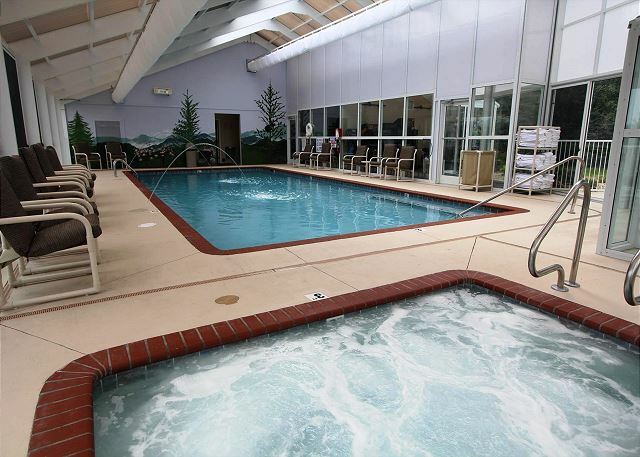 We are thrilled that you were able to enjoy the amenities we have to offer at Whispering Pines. We hope that you can visit us again soon. We were in town for the NQC convention and enjoyed our stay there. It was very comfortable accommodations. Had a little problem with the Wifi but was able to get it worked out. Thank you for staying with us for the National Quartet Convention! We are glad to hear you enjoyed your stay! I'm sorry about the WiFi glitch, but I'm glad we got it up and working for you. We certainly hope you will return soon! Although our check in was after the promised 4pm check in time, we had a great overall stay, the property was clean and free of debris, the room was also very clean. I do however recommend that flat screen televisions be placed in all bedrooms, rather than the box TV's. Thank you for taking the time to post a comment. We are so happy to hear that you had a great stay with us. We will forward your request/suggestion regarding the tvs to the condo owner. We do sincerely apologize for your delay in checking in, July has been exceptionally busy at Whispering Pines. We do try very hard to get everyone checked in within a reasonable time & close to 4 pm when check-in begins. We do hope to see you again in the future. Thank you for staying with us at Whispering Pines Resort. We are happy to hear that you enjoyed your stay with us. We look forward to seeing you again soon.